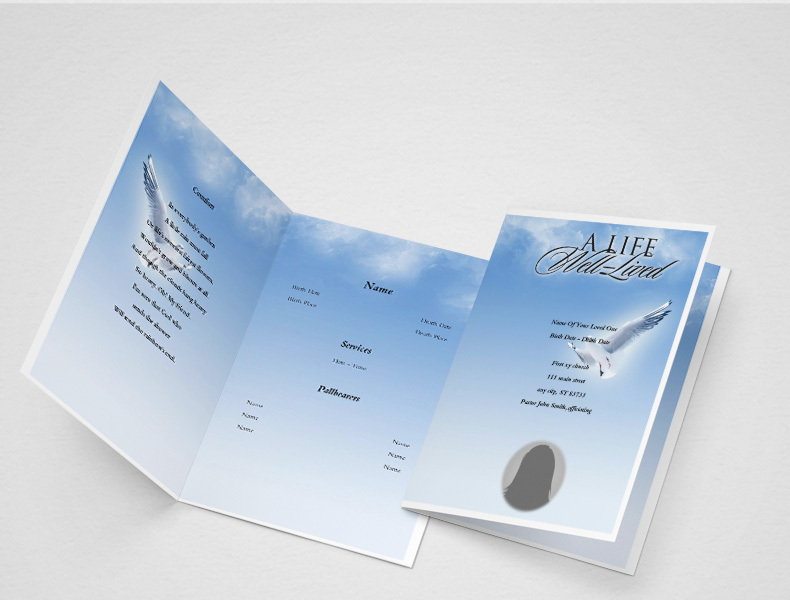 A funeral booklet is the perfect keepsake for those attending the funeral or memorial service of a loved one. It contains key achievements of the deceased person’s life as well as an overview of the funeral or memorial service. These booklets are typically prepared by the funeral home or church; however, access to customizable templates makes it easier and more economically feasible for families to create their own booklets. The look and feel of the funeral booklet is just as important as the information it contains. After considering your budget for this project — be sure to include paper and printer ink — spend some time looking over the different styles of available funeral booklet templates. You can select from standard size, single-fold booklets to larger ones with multiple pages. Be sure to choose a design that speaks to the deceased person’s personality. For example, if the deceased person was a man or woman of God, a booklet with crosses or the symbol of the Holy Spirit are a good fit. Remember, you may not have a lot of time to create this funeral or memorial booklet, so it’s best to stick with styles or designs that you know you can complete in a timely manner. Order of Service: This section gives an overview of the entire service or memorial and includes music played, prayers, readings, obituary reading and eulogy. Tribute: A brief biography of the deceased person is part of this section. It should encompass his or her accomplishments, places of residence, surviving and deceased family members, hobbies and personal stories. Photos: A collage of family and childhood photos add a special touch to funeral booklets and are typically included. Participants: Include pallbearers, flower bearers, officiants and others who helped put together and/or put together t the funeral or memorial service. Acknowledgements: In this section, the family of the deceased person thanks attendees for coming to the service. Many times, this can replace individual thank you notes usually distributed after a funeral. Remember that this booklet is a lasting reminder of the individual who died and represents his or her uniqueness.